The Rio Llizán tumbles of the Southern Flank of Volcan Quetrupillan (2009 meters). The run has two distinct sections each of which packs action and potential dangers. Unfortunately it is difficult to have proper water level to run both sections at same time. The upper 6 KM run is best run in late December through early February while the lower run is best run as low as possible which usually means March and April. To reach the class 4-5 upper run from Pucon it is a 2-1/2 hour thru Lican Ray, Coñaripe and then the frontier town of Liquiñe. From Liquiñe follow the road east towards Argentina for 3-5 KM then take first left following sign towards Paimun. The put in the locked gate and the end of the road where the Rio Paimun enters the Llizán. 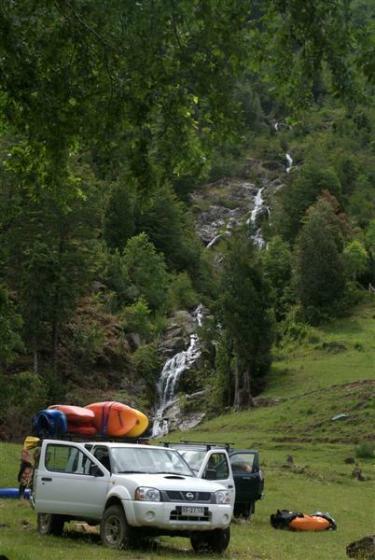 The takeout is approximately 6 KM downstream where a road winds down to a bridge over the river and this turn is marked with a sign “Agro Turismo Ñipuche De Rañinuleufu”. 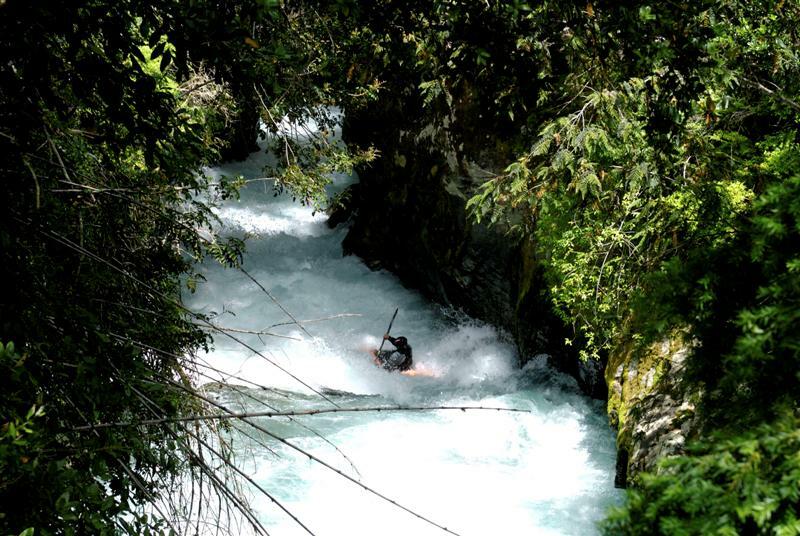 The Upper run starts out with 2 KM of easy fast moving flat water and then comes to the crux of the run. A 200 meter long basalt canyon with some burly holes and possibly logs. A wooden bridge crosses over the middle of the rapid and it can be scouted from river right by getting out at Senora Margarita’s house to take a look. Below here the river opens up with several read and run class 4 rapids and at least one possible portage. The takeout is just above the 8 meter high Salto Fosphoros which leads into a lower canyon. A good eddy just above the falls on river left leads up into a campground and the road, The upper run averages 65 FPM gradient factoring in the flatwater and water levels should be in the 10 to 25 CMS (300 to 750 CFS) range. 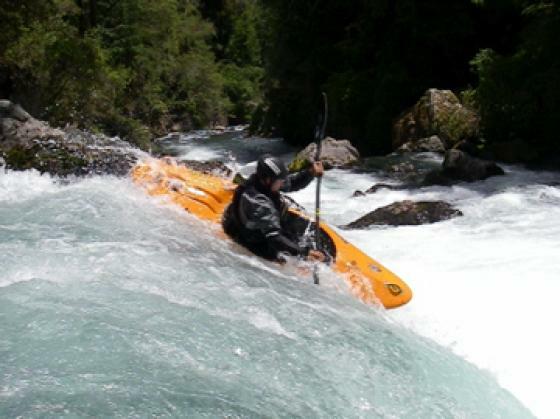 The upper section of river was first run by Zack (El sapo) Cowan and John Foss in March of 1997. Notes: The Llizan drainage like nearby Fuy and San Pedro is scheduled for a dam project. In addition a Pisicultura is being built at confluence of Rio Paimun starting in 2008. If either or both go thru this river will be either finished or simply ruined. If in the area there are 3 hot spring options. In town of Liquiñe are the commercial hot springs. 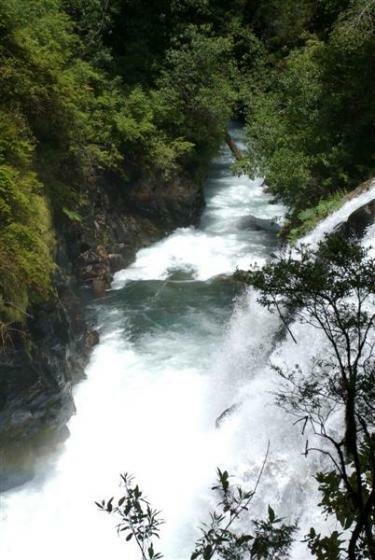 Going east toward Argentina are two others Termas Hipolito Muñoz or the Termas Huilo Huilo (recommended).